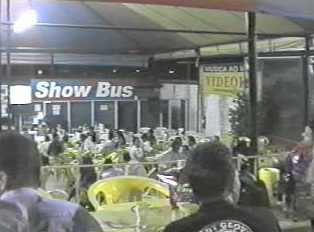 There are many different types of restaurants in Brazil. In a self-service restaurant, customers serve themselves and then weigh their plates. At the end of the meal, they are charged according to the weight of the plate. In an "á la carte" restaurant, after customers are seated a waiter comes to take the order. In this case, customers are charged by the dish. At a buffet restaurant, customers pay one price and eat as much as they want. A "churrascaria" is a traditional restaurant of the south of Brazil. In a churrascaria, customers serve themselves salads and side dishes from a buffet, but the meat (main course) is brought to the table. Each waiter brings a different type of meat, and customers can specify the type and amount they prefer. The bill is brought to the table at the end of the meal and is paid before the customers leave the table. An exception to this is the self-service restaurant where customers will be given a ticket to take to the counter to pay on the way out. Coffee and tea are usually a courtesy of the house. "Buying Coconut Water at the Beach"
"Grilling Meat at a Churrascaria"
"Waiter Serving at a Churrascaria"
"May I have a menu?" "May I have the bill?"